Released in the middle part of 2015, the Canon EOS 750D is a popular digital camera that has a detailed sensor. Built with Wi-Fi support, it lets people take pictures and videos and share them with others right off of the camera body. The Canon EOS 750D is designed for people who want to share photos with each other. It’s great for everyday photographers thanks to how it’s not all that difficult to use and should create better shots when made the right way. The camera especially does well when connecting to a variety of different devices for all sorts of uses. 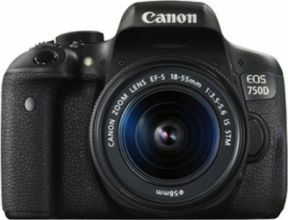 The Canon EOS 750D is a 24.2-megapixel camera. The APS-C sensor creates better shots with a greater dynamic range. It is also engineered to produce less noise when taking photos. This, in turn, creates a more detailed image when used well enough. This can be perfect for when one is looking to get different functions to work. The DIGIC 6 processor is paired up with the APS-C sensor to offer full resolution shooting at a total of 5 fps. It identifies how well light gets into the sensor. The sensor also handles low light shots quite well. It has an ISO sensitivity range from 100 to 12800. It can be extended to 25600 when a proper lens feature is added onto it if required. This is a slim camera with a 77.8mm depth measurement. It is also light at 555g. This also operates in many humidity totals including ones from up to 85 percent. The outside uses a polycarbonate resin with glass fiber reinforcement. An aluminum alloy is also added to create a stronger tone. This is built with many ports for connectivity purposes. It offers a USB, AV In-Out and external microphone input spots. It also has HDMI support. This does not work with a GPS receiver although it can use an external GPS unit through Canon’s GP-E2 material. This establishes a better connectivity control when used right. The 19-point AF mode is a popular feature on the EOS 750D to use. It creates a bright appearance that adds an extra amount of power. Four metering modes are used on the 7560-pixel RGB+IR sensor. These can be adjusted with one of four different settings. 63 segments are also used. Several shooting modes are available for different situations. These include settings for fast-moving shots and scenes taken at night. The Scene Modes feature is accessible on the back part of the screen when adjusting it to create a brighter look. The controls are predominantly all around the top part of the camera and are carefully labeled. The video recording buttons are around the main viewfinder screen. The viewfinder itself also does well when displaying how the controls are being adjusted. This offers a good control setup that should not be all that hard for a typical user to work with. The Intelligent Viewfinder feature is made with a great control feature that lets the user adjust the focus point and AF functions in real time. The touchscreen feature lets the user control the quality of these points in real time. It uses a crisp setup that is easy to use. The online connectivity feature is an especially popular feature of the camera. This uses Wi-Fi support to link the camera up to different mobile devices. A link may be generated between the camera and portable devices to let people share images or videos. The Bluetooth connectivity feature especially does well to link items up. It can even interact with a GPS receiver from another device to help the user with geotagging shots. The camera particularly works with video files of up to 30fps in speed. This creates detailed shots that will not blur all that much. The video files can be sent over to other devices through the Wi-Fi connection used here as well, thus allowing the user to share things quite well. The noise that is generated by the camera is extremely minimal. The control features on the camera, including on the viewfinder, especially make it so the images will look their best. The electronic viewfinder offers about 100 percent coverage on the screen without any changes in how it zooms into a feature. This viewfinder provides the user with a detailed appearance for when particular shots have to be taken. The battery on the EOS 750D is a Li-ion LP-E17 unit that takes about 400 images on a single charge. It is easier to get more if the camera works at room temperature. Also, the Wi-Fi feature may drain battery power depending on how active that control is working for. It even works with a power turn off feature that will shut off the camera after 30 seconds of idle time. People who want to look for a digital camera should think about the Canon EOS 750D. There are a few pros and cons for this camera that deserve to be seen. The viewfinder offers an easy control scheme. This lets users quickly adjust the focus and balance features in real time. The image processor is amazingly detailed as it quickly takes great shots. The Wi-Fi connectivity feature is especially organized to create a stronger appearance. The autofocus feature is organized well to create enough of a detailed look for many shots. There are no 4K features involved in this camera when shooting videos. The continuous shooting features are not all that easy to manage. The battery can wear out quickly in the event that there are too many connectivity functions active on the camera. The camera can start up quickly when it is turned on but it will take a little longer for some of the more detailed features all around to start working. The Canon EOS 750D will be ideal for all those who want a better camera. This is made to be detailed and easy to control.